The Great Synagogue of Budapest is among the five largest synagogues in the world and is a symbol of religious tolerance. Sadly, it also remembers a period of extreme religious hatred. By the middle of nineteenth century, Jewish residents represented about 25 percent of the combined populations of Pest and Buda, Hungary, which later merged to form Budapest. In 1854, residents of Pest began building a monumental new synagogue along Dohány Street. Ludwig Förster, the building’s architect, was reportedly unable to identify a distinctively Jewish style, so he based the exterior design on Islamic buildings in Spain and Morocco, incorporating two onion domed towers resembling minarets. He located a rose window reminiscent of the great Gothic cathedrals above the entrance. The interior included three aisles and a nave resembling European basilicas and a 5000-pipe organ, unique among synagogues. When completed in 1859, the Great Synagogue had 1492 seats for men on the main floor, 1472 seats for women in the balconies, and standing room for another 2000. 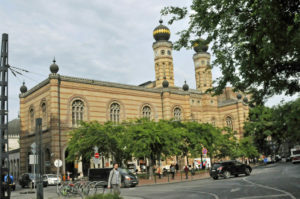 The Great Synagogue was severely damaged during World War II by the Nazis, who used it as a stable. Under the Communists, the few Jews remaining in Budapest began using it again for worship. After Hungarian democracy was established in the 1990s, the synagogue was restored with government funds and private donations. Today, the Great Synagogue’s ark includes scrolls recovered from synagogues destroyed by the Nazis. The synagogue building is attached to a Jewish Museum, which includes a Holocaust Room remembering the events that led to the deaths of about 400,000 Hungarian Jews. A cemetery north of the building includes a mass grave of those killed in the Holocaust. The interfaith design of the Great Synagogue has influenced synagogue designs around the world. The Central Synagogue in New York City, built in 1872, is almost identical.